Wednesday's Copa del Rey final defeat by Real Madrid, coming on the back of a Champions League exit to Atletico Madrid and a La Liga upset at Granada, marked the first time Barcelona have lost three consecutive games in more than a decade. More importantly, it left Barca's chances of claiming a major honour this season hanging by a thread, meaning they are likely to end a campaign without serious silverware for the first time since 2008. It has been a disappointing few weeks for the Catalan club, who face a period of uncertainty and a likelihood of significant changes in the near future. But where, and how? Here BBC Sport examines what the next few months at the Nou Camp might have in store. Although he has only been in place for three months, club president Josep Maria Bartomeu is facing growing pressure to call early elections. Predecessor Sandro Rosell resigned after the Spanish prosecutor said it would investigate the signing of Neymar to see if the club had defrauded the treasury of unpaid tax. Bartomeu, a close ally and friend of Rosell, was vice-president at the time of the signing. 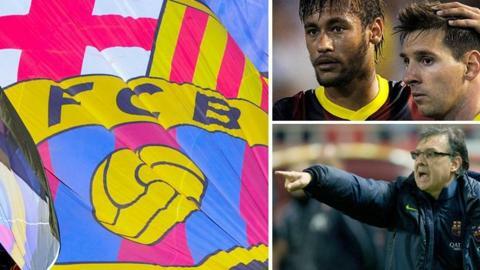 Since then, another bombshell has been dropped, with Uefa banning Barca from making transfers during the next two windows. Although that case is subject to appeal, it raises more question marks over the running of the club. Many fans are also angered by the board's decision to abandon the policy of giving the club's shirt sponsorship to Unicef in favour of a commercial deal with Qatar Airways. With the team's stagnation added to those black marks, an increasingly hostile environment has been created; in a local newspaper poll on Wednesday, an emphatic 96% of respondents stated they do not trust the board. However, that doesn't mean elections are around the corner. Bartomeu has shown no inclination of relinquishing power, and a complex vote of no-confidence process would have to be undertaken to force elections before the board's mandate expires in 2016. But if Barca's remaining home games this season are marked by serious and sustained opposition to Bartomeu, he may be pressured into calling elections after all. The presidency, then, remains uncertain. And it's a highly significant issue because ultimately the president and the board will be responsible for deciding who will manage the team and which players will be signed (if the Uefa ban is overturned). Two more men under increasing pressure are director of football Andoni Zubizarreta and manager Tata Martino. Former Barca goalkeeper Zubizarreta, who replaced Txiki Begiristain in 2010, has been accused of failing to address the squad's lack of depth in the centre of defence, the centre of midfield and in attack, where Martino is unable to call upon a single genuine centre-forward. Zubizarreta is a dignified and eminently likeable man, but somebody will have to be held responsible for the obvious deficiencies within the squad, and he well may end up carrying the can. For Martino, it's been an exceptionally trying first season at the Nou Camp after he was recruited from Argentine club Newell's Old Boys last summer. It's easy to feel sympathy for the former Paraguay boss as he attempts to squeeze the best out of an unbalanced squad which needs a modification in playing style against the backdrop of continual behind-the-scenes turmoil. However, he has contributed to his own downfall with inconsistent team selections, failed tactical experiments, uninspired and predictable substitutions and a general lack of firm direction. After a year in the madhouse of the Nou Camp, it must be tempting for Martino to pack his bags and return to South America, where he would find no shortage of job offers. There have been many reports - officially denied - that he and the club's hierarchy have already agreed to part ways in June, and his departure is looking increasingly inevitable. If that does happen, Jurgen Klopp from Borussia Dortmund, Ajax's Frank de Boer and former Barca great Luis Enrique, who is in charge of Celta Vigo, have been touted as potential replacements. Ultimately, though, the decision will rest with the club's president… whoever that might be. Uefa's transfer ban, if it is upheld, greatly complicates an already tricky situation in terms of Barcelona's playing personnel. With Victor Valdes and Carles Puyol leaving at the end of the season, and another pillar of the team's recent success, Xavi, gradually declining in influence because of advancing years, Barca need at least three new players; four if you include addressing the absence of a striker. Borussia Monchengladbach's Marc-Andre ter Stegen has been lined up to replace Valdes in goal, while Barca may revive their attempts to sign former targets Thiago Silva, from Paris St-Germain, or Chelsea's David Luiz in defence. There is still frustration amongst fans that the club's negligent failure to trigger an increase in Thiago Alcantara's buyout clause allowed the gifted Spain international to join Bayern Munich in a relatively cut-price deal last summer, because he had long been regarded as Xavi's natural heir in the centre of midfield. There now appears to be nobody within the existing squad possessing the skillset required to run a midfield at the highest level - with the possible exception of Cesc Fabregas, who has rarely been given the chance to do so. The middle of the pitch, without doubt, needs urgent attention because Xavi can't go on forever, and Barca's greatest worry is that Uefa's ban will be upheld, forcing them to spend another year muddling through with their existing squad when it requires significant renovation. Tiki-taka, or not tiki-taka? That is the question which has bothered Barcelona since a 7-0 thrashing by Bayern Munich in last season's Champions League semi-final sparked suggestions other teams have worked out how to counter their famous high-pressing and short-passing style of play. This season, Martino has made an unconvincing attempt to sit on the fence, insisting the team's overall ethos will not change whilst trying to introduce a more direct approach, with a particular increase in long, diagonal passes in an attempt to stretch the opposition. The way forward remains unclear, with many fans (and some influential squad members) insisting the old ways can still be successful if they are executed well, while others argue the team need to move with the times. Central to the debate is the role of star player Lionel Messi, who has occasionally been shunted out to the right wing by Martino in the hope of finding more space, working on the belief opposition teams are more capable of defending against Messi's deep-lying 'false nine' forward role. An increasingly influential train of thought is Messi will end up withdrawing to a more conventional 'number 10' playmaking role behind a physically imposing centre-forward, who would act as a focal point of the attack while also keeping the opposition centre-backs occupied. Whether for tactical, physical or mental reasons, Messi has been well below his usual peerless standards in recent weeks, and a priority for the president (whoever he may be) and the manager (whoever he may be) will be recreating an environment and playing system that gets the most out of their best player. Another decision will be how Neymar can fit into that picture. So far, there has been little indication that anyone at Barcelona knows how they can accommodate their two South American stars in the same line-up. It has to happen soon. Despite the gloom encircling the Nou Camp, any analysis of Barcelona's mid- to long-term prospects would be incomplete without acknowledging there are also plenty of reasons for optimism. A squad containing Messi, Neymar, Sergio Busquets, Gerard Pique and Jordi Alba should be capable of challenging for honours for many years to come. Others must be added, and the team's playing style needs to be refined and defined, but the foundations for success are in place. The famed La Masia youth academy is still delivering a conveyor belt of talent as well. Sergi Samper (midfield, 19), Adama Traore (winger, 18), Denis Suarez (attacking midfield, 20) and Alex Grimaldo (full-back, 18) are particularly highly-rated members of Barca's B team, and the next age group down won the inaugural Uefa Youth League this week with a 3-0 victory over Benfica. Barca's commercial growth has also been impressive in the past few years - perhaps the biggest success of the Rosell/Bartomeu presidency - with their growing penetration of Asian markets set to provide a steady stream of income to ensure ongoing financial competitiveness. And, despite the misgivings over the capabilities of the board, Barca's day-to-day business is underpinned by an excellent staff in all areas of administration, with some of the brightest minds in professional sport applying themselves to the task of keeping their club at the top of the pile - an important, if often overlooked, factor. So Barcelona's future should still be bright, but it might be a bumpy ride for the next year or two.